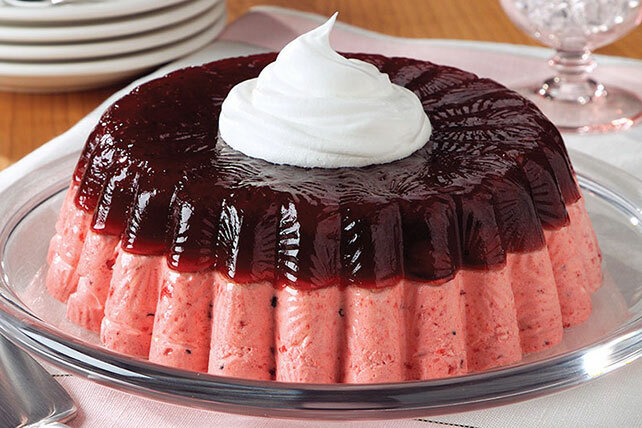 Impress Thanksgiving guests with our Layered Low-Fat Cranberry Mousse Mold. No need to tell them how easy it is to make this cranberry mousse mold! Add boiling water to gelatin mix in large bowl; stir with whisk 2 min. until completely dissolved. Add cranberry sauce; stir until blended. Stir in cold water. Pour 1-1/2 cups gelatin mixture into 6-cup mold sprayed with cooking spray. Refrigerate 45 min. or until set but not firm. Meanwhile, refrigerate remaining gelatin mixture 45 min. or until thickened. Stir 2 cups COOL WHIP into plain gelatin (in bowl) until blended. Pour over gelatin layer in mold. Refrigerate 4 hours or until firm. Unmold gelatin. Top with remaining COOL WHIP. Dip mold in warm water for 15 sec. Gently pull gelatin from around edge with moist fingers. Place moistened serving plate on top of mold. Invert mold and plate; holding mold and plate together, shake slightly to loosen. Prepare using 2 pkg. (0.3 oz. each) JELL-O Raspberry Flavor Sugar Free Gelatin.